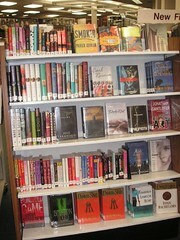 Posted by sneaks in BCPL best practices, slant shelving. Are your bottom shelves packed with books? Loosen up a little! This New Fiction display is a good example of how to utilize those hard-to-reach bottom shelves. We chose books by best-selling authors, with easy to read titles and bold colors for greatest visibility, and shelved them face-out on the lowest shelf.